Kanban – Lean Learning Revolution! I’m a big fan of Dean Leffingwell and his work on the Scaled Agile Framework (SAFe). He’s been bringing lean thinking to software development for some time now. I work in a massive IT organization that has identified SAFe as how we’d like to develop software going forward. Listen for these key concepts in the video below. Value streams are the central organizing construct for SAFe. If you are in IT, you owe it to yourself to get up to speed not just on SAFe, but on the underlying lean thinking concepts that are driving it. If you don’t, you risk getting left behind both organizationally, and in your IT career. Alex Yakyma is a thought leader in the SAFe community and this is a great article on the how’s and why’s related to kanban within the Scaled Agile Framework (SAFe). The use of Kanban techniques for managing workflow is growing in software, as well as in other industries. Originally a technique derived from lean manufacturing, Kanban is a lightweight way of visualizing and managing work of any kind. It’s easy to adopt and provides sophisticated constructs for continuing improvement as teams master the method. While not a software-specific method by original intent, its application in software development can be quite useful. It provides a more granular view of the flow of work through the team, illustrates bottlenecks and delays to be addressed, and increases flow by application of work-in-process limits. Properly used, Kanban provides a powerful set of constructs that every software enterprise should be able to apply in the scaled systems context. This article describes how Kanban can used by SAFe Teams in the content of their Agile Release Train. This is a great short video about kanban in the software development world. The following is from Lean IT thought leader, Karl Scotland. He pulls lots of great info together explaining how kanban in the real world. There has been some noticeable increase in interest in Kanban recently, with a number of people asking for more basic info, and more people writing new blogs and articles. This is my attempt to describe in more detail my take on it all, which I refer to as Kanban, Flow and Cadence. A Kanban system is a mechanism for controlling the work in the software development system. 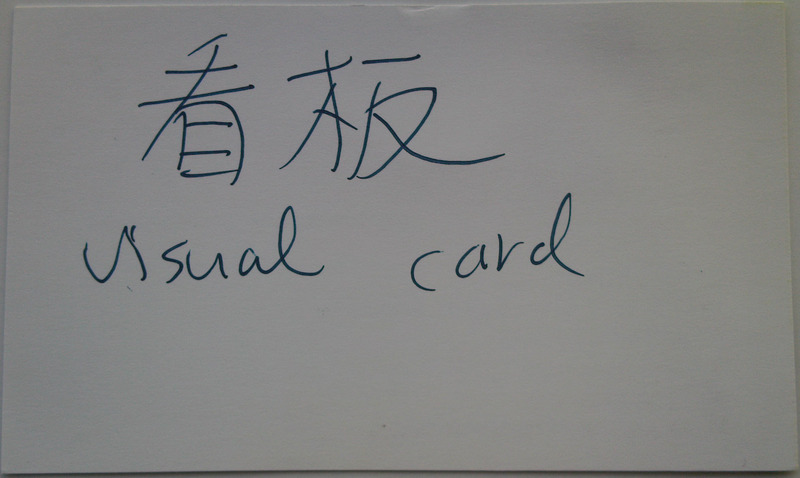 Kanban can be defined as “visual card”, as shown below – kindly written for me by Kenji Hiranabe [?] at Agile 2008. Kanban is what enables a pull system for just-in-time work. 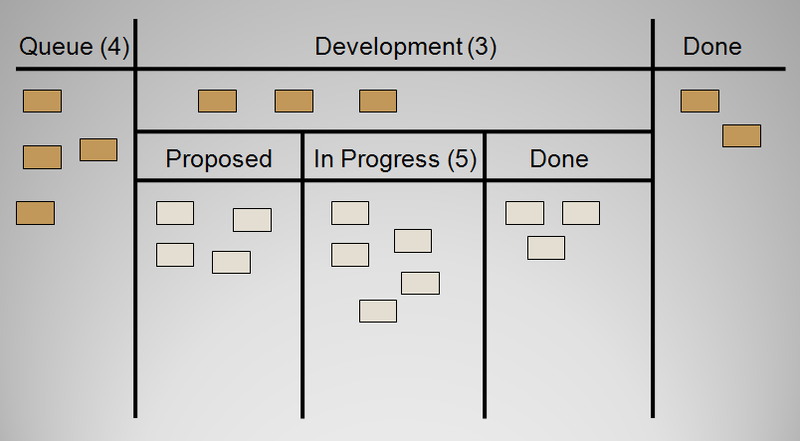 What does a Kanban System look like for software development? Very simply, there is a queue of work, which goes through a number of stages of development until its done. When work is completed in a stage, it goes into a downstream queue for the next stage. When someone needs new work to do, they pull it from their upstream queue. This can be depicted as below. That looks very like a typical Agile Task Board, with maybe a few more steps, although there is nothing to say there can’t be a single development stage. However, there is one more important element which really defines a kanban system – limits. There are two basic limits – Queue limits and WIP limits. Queue limits are designed to avoid premature work. This how just-in-time is achieved. The limit should be large enough to keep the team busy (i.e. there is always something in it for the team to start work on), but small enough to avoid premature prioritisation (i.e. having things sitting in the queue for too long before they are begun). Ideally the queue should be FIFO, although this is a guideline rather than a hard rule, as sometimes available skills or other resources mean that it is not always possible. Work In Progress limits are designed to reduce multi-tasking, maximise throughput, and enhance teamwork. 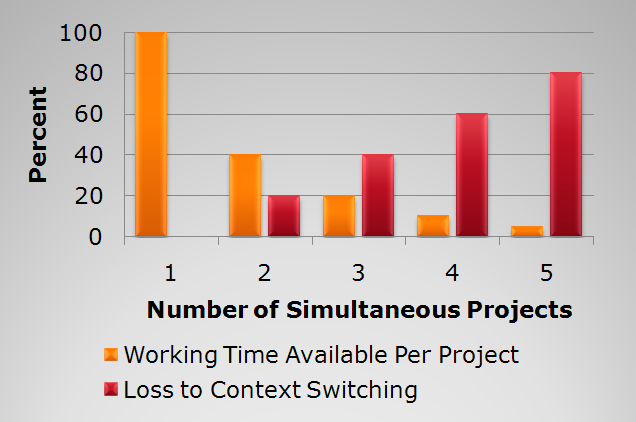 Reducing multitasking is beneficial for two primary reasons. 2) Performing tasks sequentially yields results sooner. As the diagram below shows, multi-tasking A, B and C (on the top), delivers A much later, and even C slightly later, than sequentially (on the bottom). A great exercise to demonstrate the effects of multi-tasking was described by Clarke Ching. Therefore, to improve cycle time there are two options; reduce the number of things in process or improve the average completion rate. Of the two, reducing the number of things in progress is the easier, and once that is under control, then the more challenging changes to improve completion rate can be applied. Finally, by having fewer work items in progress, then the team is able to focus more on the larger goals, and less on individual tasks, thus encouraging a swarming effect, and enhancing teamwork. Limiting Work In Progress like this can seem unusual for teams, and there is often a worry that team members will be idle because they having no work to do, but are unable to pull any new work. The following guidelines can be useful to help in this situation. Can you help progress an existing kanban? Work on that. Don’t have the right skills? Find the bottleneck and work to release it. Don’t have the right skills? Pull in work from the queue. Can’t start anything in the queue? Is there any lower priority to start investigating? There is nothing lower priority? Find other interesting work. They key question here are what constitutes lower priority investigative work or other interesting work. Essentially it is work which won’t create any work downstream, will improve future throughput and can be paused as soon as existing kanban related work is available. Lower priority work could be spikes or analysis for known impending work. Other interesting work could be refactoring, tool automation, personal development or innovation. WIP limit sizes can depend on type of work and size of team and should be adjusted to achieve maximum flow. One approach is to start small (e.g. a limit of 1) and increase as necessary. Another is to start larger (e.g. a limit of half the team size) and reduce until the sweetspot is achieved. The consequences of using a kanban system are that the Product Backlog can be eliminated, because the immediate queue is the only work of interest, timeboxed iterations (i.e.Sprints) can be eliminated, because work is pulled as necessary, and estimation can be eliminated, because work is not planned into iterations. In particular, Lean emphasises ‘One Piece Flow’. This means moving one piece at a time between stages in a workflow as opposed to moving batches of work between stages in a workflow. The ‘One Piece’ in a Kanban system for software development can be thought as the Minimal Marketable Feature, as described by M Denne & H Cleland-Huang in Software by Numbers. “A minimal marketable feature is a chunk of functionality that delivers a subset of the customer’s requirements, and that is capable of returning value to the customer when released as an independent entity”. The kanbans should be minimal so that they are as small as possible in order to enable progressive delivery to realise the product sooner, reduce feature bloat and focus on the the core features which are the most important, and minimise complexity because each feature has a cost to a user. The kanbans should be marketable in a number of ways. A useful guideline is that an MMF is marketable if it is something that could be written about on a product blog. The kanbans should be features which are distinct, deliverable and observable. The INVEST acronym (Independent, Negotiable, Valuable, Estimable, Small, Testable) as described by Bill Wake, can also be useful for applying to MMFs. The Marketable element of MMFs means that they may sometimes be larger than typical User Stories, which often break work down such that while they can be incrementally delivered, and show some element of value, they are not marketable in their own right. Therefore, it is important to understand an MMFs Value Stream in order to deliver the whole MMF as quickly as possible. A value stream describes the steps, delays and information required to deliver a product, and can often be used to decide the steps in an initial kanban system. 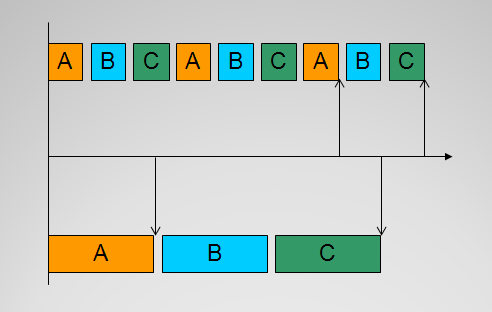 With large MMFs, the User Stories become more of an analysis technique in order to enable incremental delivery of an MMF, without losing sight of the overarching MMF. I describe how a continuous flow can be achieved with MMFs in The Anatomy of an MMF. 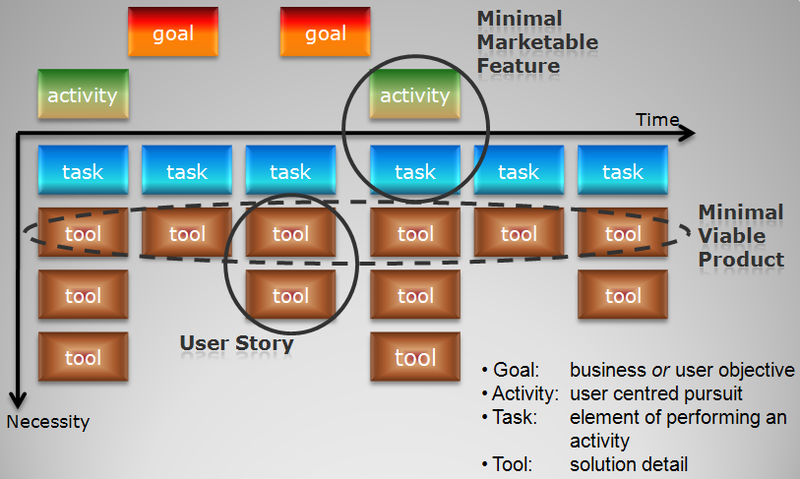 A number of techniques can help manage the relationships between MMFs and User Stories in order to realise the benefits of both. One is User Story Mapping, as descried by Jeff Patton. I have also recently been working in a regulated environment where User Case Goals and Sub Goals have provided the MMFs, with the detailed scenario paths and steps providing the additional details. 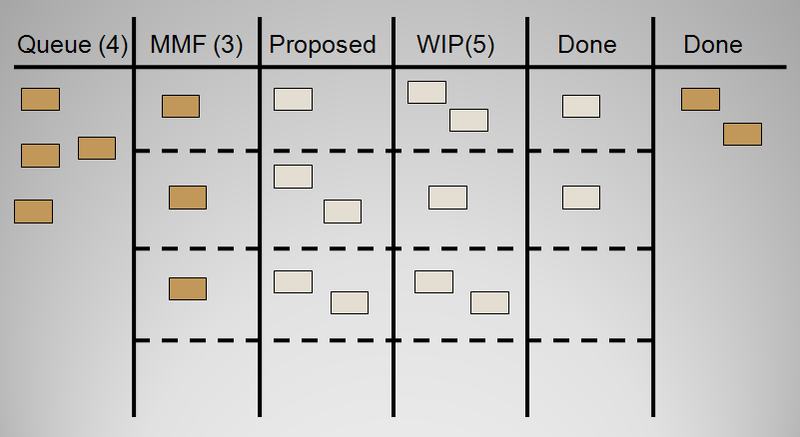 A further enhancement is to use two-tier Kanbans, with one tier for the MMFs, and another for the User Stories. The consequence of applying the concept of Flow is that emphasis is placed on using larger, value-focussed MMFs, rather than smaller, more incremental Stories. Throughput allows forecasting of future capability, without needing to specify what might be delivered. Cycle Time allows commitment by becoming an SLA with the business (see Kanban Commitment). Where the size of work varies, from large new features to small fixes and change requests, then a classification of MMFs can enable a range of cycle-times. Both Throughput and Cycle Time can be charted and trended, in a similar way to XP’s Velocity, as a means to encourage the team to improve. 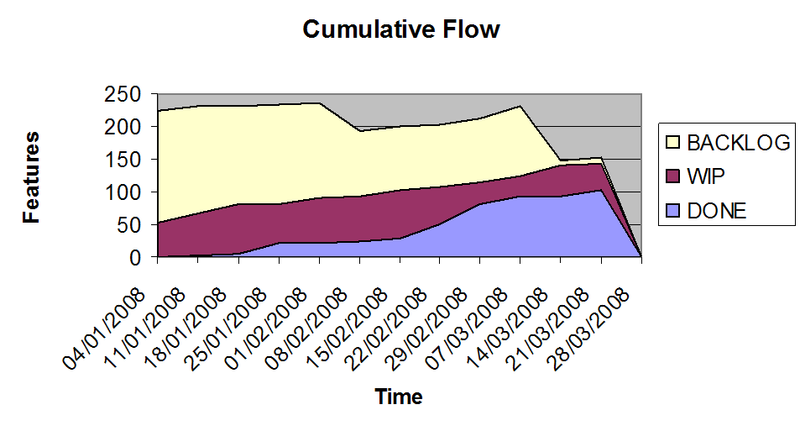 A Cumulative Flow Diagram can also make visible how the work is flowing through the system and highlight bottlenecks. For longer term forecasting, a quarterly planning cadence focusses on quarterly goals and objectives. MMFs can subsequently prioritised to meet those goals and objectives. A regular release cadence will build up trust that the team will work to its full capacity and throughput. Other cadences, are daily stand-up meetings, and regular retrospectives and Operations Reviews as described by David Anderson. Some teams are using a Retrospective Kanban to signal when a retrospective is necessary, and I have already blogged briefly about Kanban and Retrospectives. The consequence of Cadence is that commitment and reliability is achieved though measurement as opposed to planning. A Kanban System manages the workflow in a way which allows the Product Backlog, Timeboxed Iterations and Estimations to be eliminated. Cadence allows iteration input and output to be de-coupled and achieves commitment and reliability via measurement rather than planning. Further resources and information can be on my Kanban Page, including most of the material which has influenced and directed my thinking. reposted from Karl Scotland’s AvailAgility blog. As I was looking for kanban software I came across this post from the pros as the Agile Scout. It seemed very “un-lean” to do anything but repost the info here! Kanban is growing like wildfire. Many organizations are finding value in this simple process via a “pull” system: The production of work is determined by the demand from the customer. 1. You can build a Kanban board. 2. You can use a tool and an actual board! Here is a list of the best Kanban tools out there today. Stay tuned for Tool Reviews from your very own Agile Scout! Got a cool tool to add to the list? Let us know. We review stuff.